On 28th February, Marianne Thyssen, Commissioner for Employment, Social Affairs, Skills and Labour Mobility met with civil society representatives to discuss the European Pillar of Social Rights and the 2030 Agenda for Sustainable Development and its goal to end poverty. With the European Pillar of Social Rights, the European Commission aims to tackle the aftermath of the financial crisis and strives for an upward convergence of welfare systems and fair labour markets across Europe. European Commission President Juncker aims to achieve a “social triple-A rating” for the European Union, giving more weight to social priorities alongside economic and financial issues. In the consultation meeting, Commissioner Thyssen pointed out: “In the current political and economic context, delivering real benefits for people and strengthening their confidence should be our first goal: no one must be left behind. Indeed, in the European Union, with all its diversity, we share a belief that increased competitiveness should go hand-in-hand with social progress”. As a network of grassroots (pro) Roma organisations working on a daily basis with the poorest minority in Europe, we welcome the efforts of the European Commission to renew and improve the European social agenda to achieve positive social change and to create better living conditions throughout the EU, and appreciate the dialogue with civil society. ERGO Network asks the European Commission to increase the focus of the Social Pillar on Roma as the most marginalised European minority, disempowered through poverty and discrimination. According to the Second European Union Minorities and Discrimination Survey (EU-MIDIS II), 80% of Roma are at risk of poverty compared with an EU average of 17% and only 30% are in paid work, compared with the average EU employment rate for 2015 of 70%.The European Pillar of Social Rights is a key opportunity to dedicate specific measures and indicators to decreasing this extreme inequality and combatting social exclusion of Roma. 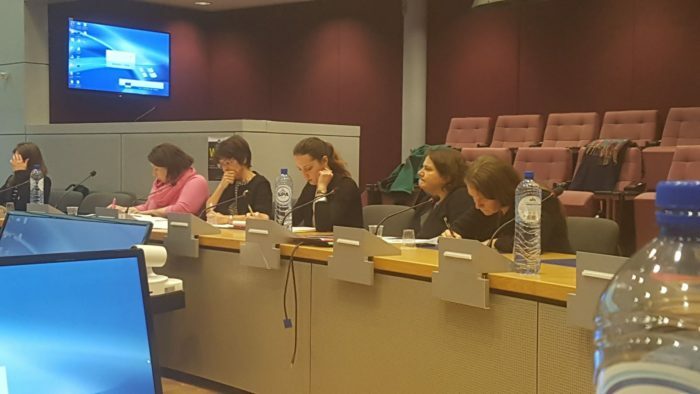 Jamen Gabriela Hrabanova, deputy director of ERGO network states: “Only when the most discriminated minority in Europe can claim their social rights and benefit equally from social protection systems, the European Union can obtain the so-called social triple-A rating. We would like to see a clear commitment to Roma inclusion in the final proposal of the European Commission”. ERGO Network brings together over 25 (pro) Roma grassroots organisations from across Europe to empower communities, fight antigypsyism and achieve equal citizenship.